Vancouver is said to be one of the most expensive cities in the world, both for locals and visitors. Finding ways to save money on tours, attractions and especially accommodation is essential for the budget traveller to really enjoy and get the most out of the city. 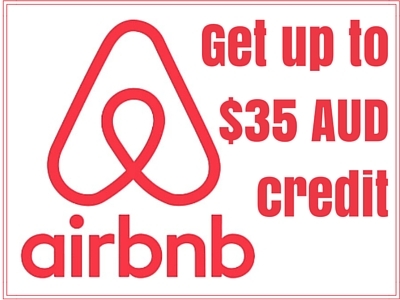 A great place to start saving money when planning your trip to Vancouver is with accommodation. As a budget traveller, my mind straight away goes to hostels. They are the most affordable type of accommodation (apart from coachsurfing, but that’s not for everyone) and they come packed with facilities you wouldn’t find in most hotels. There are stacks of hostels in Vancouver varying in size, location and facilities. I went with HI Hostels which has two locations in Vancouver. Both are centrally located with similar facilities but I picked their Central location because it’s a little closer to the metro making it easier for arriving and leaving. 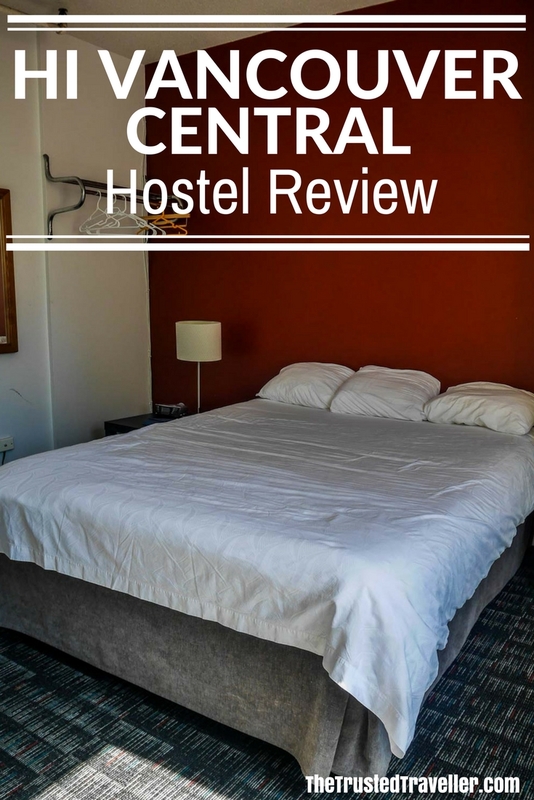 Here is my review of HI Vancouver Central. I hope it helps you to make an informed decision about where to stay on your next visit to Vancouver. Really it couldn’t get any better! 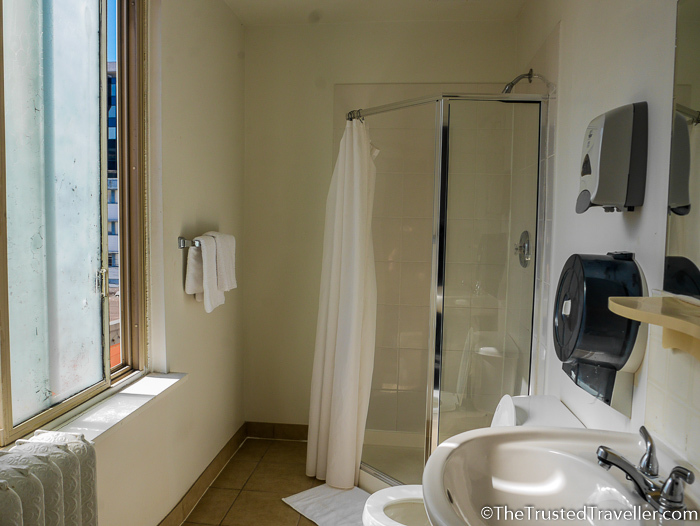 Located right in the heart of downtown in what is known as the Entertainment District, on Granville Street. Surrounding HI Vancouver Central are some of the oldest theaters in Vancouver. The Orpheum and Vogue Theaters are just seconds from the front door and there you can see local and international acts perform. There’s also lots of cheap places to grab a drink or a meal and some great pubs and clubs for those looking to party. Buses stop almost at the door and can take you to all corners of the city plus Vancouver City Station and Granville Station are less then 10 minutes walk away. 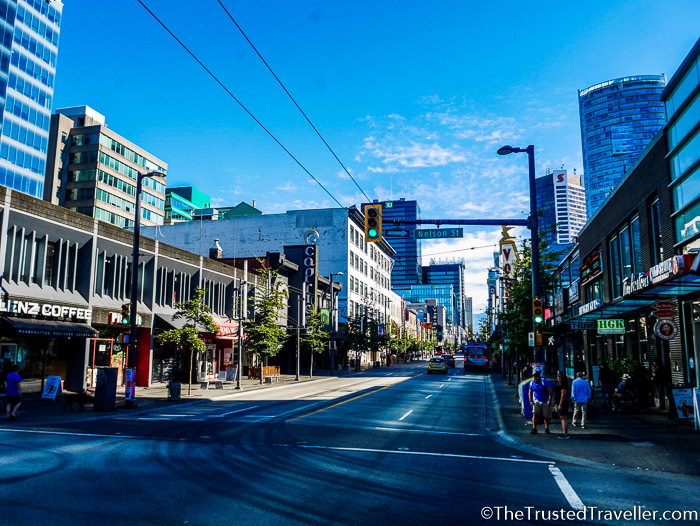 Popular shopping and eating area, Robson Street is just minutes away and the rejuvenated Yaletown district with its alfresco cafes and bars, is an easy walk also. Basically, everything you need is less than 20 minutes away on foot. It couldn’t get more central than that! Rooms at HI Vancouver Central range from multi-bed dorms with shared facilities to private rooms with full bathrooms. My three night stay was in a private room with full bathroom. I’ve gotten to an age now where sleeping in a dorm just isn’t for me but I enjoy the facilities a hostel offers (more on that below) so I love that I can have more own room. First impressions of the room were that is was simple yet very spacious with just a double bed and single chair furnishing it. But during my stay I found that really that was all I needed. I never say hi n the chair because I spent very little time in the room, only to sleep. The bed itself was very comfortable with a firm yet soft mattress, crisp clean linen and ample pillows. Air conditioning is a great touch and very much needed for the unseasonably warm weather happening during my visit. There was also a nice view looking out over the rooftops of Vancouver from the window. And plenty of hooks for hanging clothes and towels plus ample space for my luggage. The private bathroom was also very spacious and fitted with what looked like relatively new fittings. I’m a really stickler for water pressure so I was happy to discover that it was just right! Everything was immaculately clean when I arrived and to my surprise, the room was serviced daily which is something that is rare in a hostel. As I mentioned earlier, it is the huge range of facilities that draws me to hostels. And HI Vancouver Central has a bunch of great free and low cost facilities for the budget traveller. Starting the day right with a good breakfast is important for keeping up your energy for all those activities and sightseeing. At HI Vancouver Central you get a FREE breakfast served in the communal kitchen each morning. This includes toast, bagels, fruit, cereal, tea, coffee and juice. Simple but more than enough to start your day right! And speaking of the communal kitchen, it comes fully stocked with all the cooking appliances and utensils you will need to prepare yourself a simple meal. There is a small seating area for you to enjoy your meals and an two adjacent lounge areas you can chill in while eating and at other times of the day. One lounge area has a TV and the other is filled with books and games. Wifi is free and available throughout the whole building. I found it very reliable on the top floor where my room was as well as in the kitchen area and at reception. The best of their facilities is the event board in reception. On every day of the week, HI Hostels has something organised to help you make the most of your time in Vancouver and meet fellow travellers. The day I arrived there was a rooftop BBQ at the sister Hostel, HI Downtown, just a few minutes away. 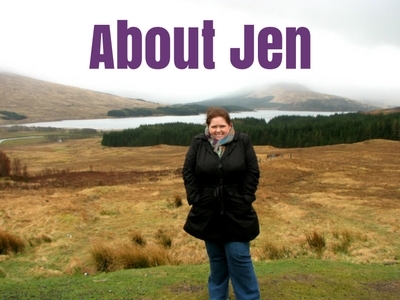 On other days there are pub crawls, day trips, sightseeing tours and comedy and movie nights. Something to suit everyone! 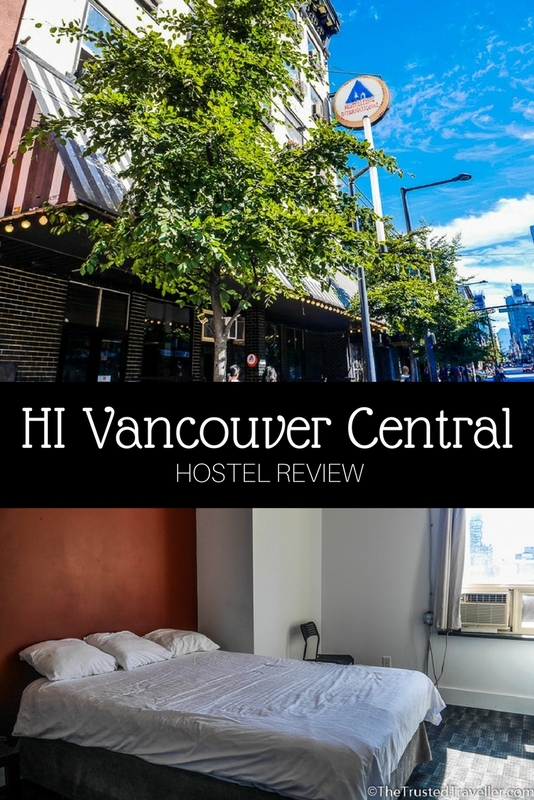 My stay at HI Vancouver Central was excellent and I wouldn’t hesitate recommending it to other solo travellers (of all ages) and those travelling as a couple of group. It has amenities and room configurations to suit everyone’s needs. And while the accommodations are simple, I found everything to be immaculately clean and the atmosphere to be friendly and safe. Disclaimer: Thank you to HI Hostels for hosting me. As always, all opinions expressed in this post are my own. 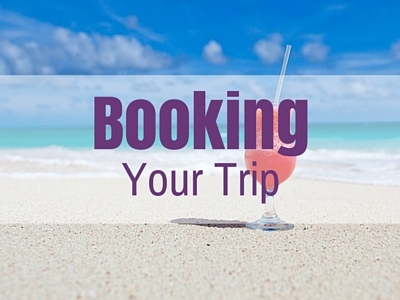 Find more accommodation recommendations on my Where to Stay page. Does HI Vancouver Central sound like the type of place you’d like to stay in Vancouver?